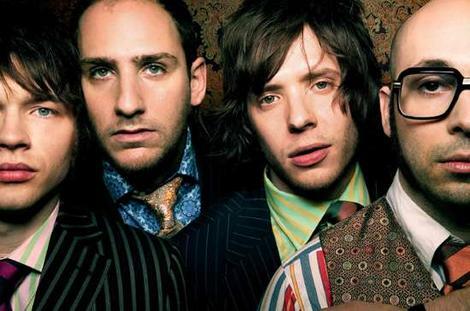 OK Go will make history this weekend by being the first band to debut a video at the Bonnaroo Music Festival in Manchester, Tennessee this week. The video “End Love” will officially debut on Tuesday on the band’s website, but fans waiting to watch the US/England game on a giant screen that is being set aside for the matchup will get an exclusive viewing before the World Cup match begins. The World Cup matchup between the US and England has become one of the most incredibly hyped games of the tournament thus far, and thousands are expected to take a break from the music to watch the game being broadcast from South Africa on the “Lunar Stage”. The game will begin at 1:30pm EST. The video will precede it by ten minutes. OK Go has earned a reputation for it inventive videos. The Grammy winning band recently made a hit with their video “And This Too Shall Pass”, which was filmed inside a Rube Goldberg machine that OK Go created. Like the video below, the new clip was shot in one continuous take, but over 21-hours using time-lapse photography. The “End Love” video will be in support of the band’s upcoming album Of The Blue Colour of the Sky. The album will be available to download through band’s own Paracadute label on June 29, and be distributed in stores by Sony. Since splitting with its label to go independent, OK Go has gone on to become the most-downloaded bad ever.